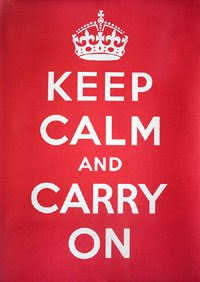 So around the second world war Britain decided to print a bunch of motivational posters with a stiff upper lip twist. The posters were never distributed and the warehouse where they were kept trashed the lot. An artist found a reprint of the original in the early 2000s, printed one, had everyone else ask for their own copy and...that's how spoofs are born!